JABFilm Production - Norway/Palestine 2016, 58/80 min. Mohamed Jabaly, 24, aspires to make films in Gaza City, despite the lack of water, electricity, and closed borders that are part of every ‘normal’ day under the 7-year Israeli blockade of Gaza. While many young people dream of leaving Gaza, Mohamed wants to help. 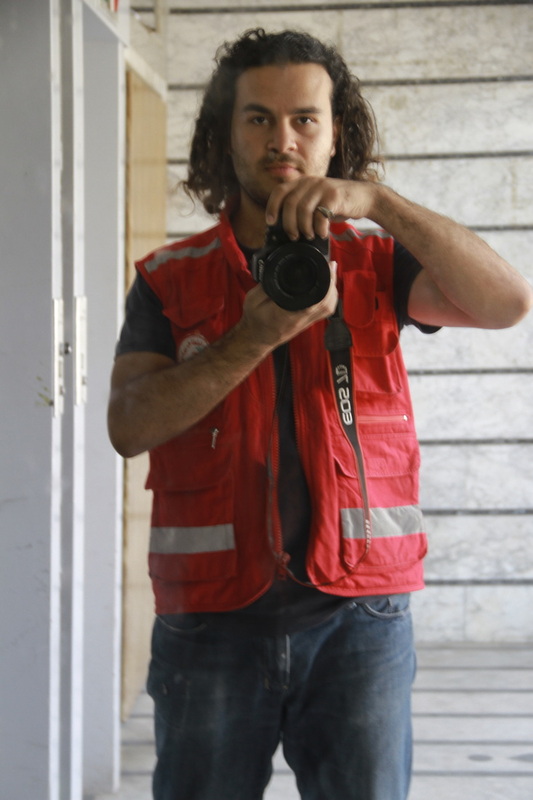 When he hears the news of a new Israeli offensive on Gaza in July 2014 he decides he cannot merely ‘wait for death’ but must do something and joins an ambulance crew to document the war. Mohamed comes of age among broken bodies, terrified families, and the constant risk of sudden death. He has never witnessed the effects of violence up-close. Within the first few days of war, he finds himself helping victims of a massacre. It felt like being in the middle of a theatre play. I saw blood. I tasted the pain in the eyes of women, fear in the faces of children. To whom could I show these images that are not merely images? 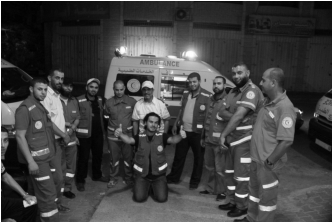 The ambulance team is led by captain Abu Marzouq who saved lives in many of Gaza’s wars. At first, the captain is intense and a little intimidating, not much of a talker, and each day Abu Marzouq and the crew are at the eye of the storm. 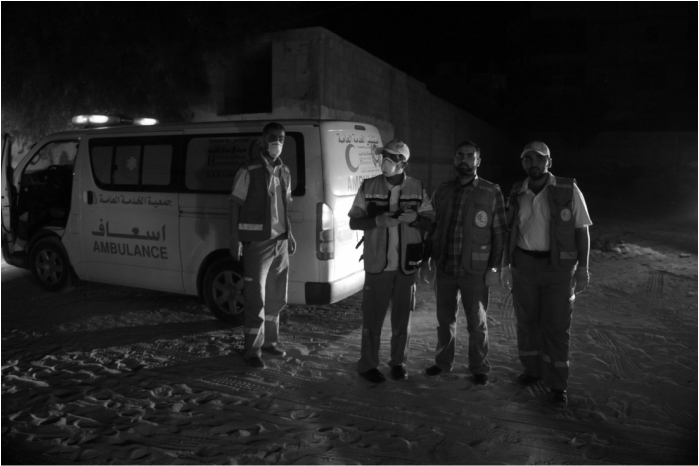 When four 9-year old boys are hit by a missile on Gaza Beach, they are one of the first ambulance crews on the scene. Mohamed cannot tell his family what he’s going through. He begins to feel close to his crewmates, who joke and encourage one another despite the fear. Abu Marzouq takes Mohamed into his confidence, and Mohamed discovers a man full of life and love for his co-workers. 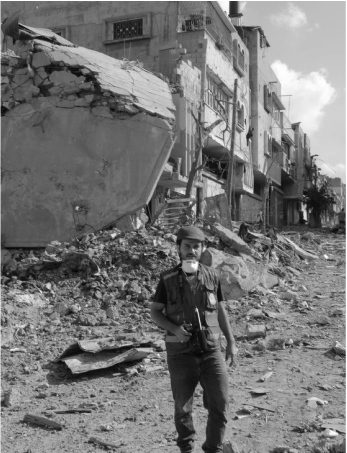 The turning point comes when Mohamed and his team are hit by a bomb while inside a building. Abo Marzouq is injured and while waiting to find out if he is going to be ok, Mohamed struggles with despair and the urge to run away. Was this really worth it? I felt like running away, but there was nowhere to run. Visual Approach: The cinematic language of the film has two distinct modes. The first is raw hand-held footage from inside the ambulance, arriving moments after bombs have fallen, and capturing the media chaos at the hospitals where crowds of photographers circle around grieving mothers, father, sons and daughters, as doctors and nurses fight to reach the operating room. This material catches the experience of war from the eye of storm. The viewer is there with Mohamed, hearing his breath as he struggles to comprehend the broken bodies of the young boys killed on Gaza beach, or running blindly from a bombed building. 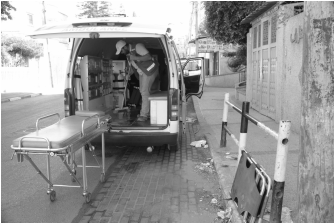 These images have a superficial similarity to the short TV clips on mainstream television, but the level of detail and the human presence of the person behind the camera allows us to appreciate details and to grow close to the ambulance captain and his team. They must maintain composure and stay calm in the face of absolute chaos and terror. Their presence and attitude is both practical and symbolic. They are the face of what is decent and good, and offer simultaneous relief to the citizens of Gaza and the viewers of the film. The second mode of the film is more reflective. There are quite moments when the ambulance crews are on break, checking on their families, joking with one another. They clean the blood and bone fragments out of the ambulance and prepare for another shift. We hear Mohamed tell his story, to understand both how he felt in those moments, but also now, looking back. These sequences may replay images in a different tone, as a series of stills or slow motion. Through Mohameds quiet and understated descriptions we begin to perceive the struggle between trauma, fear, rage and hope as this exceptionally humble young man experiences a terrible trial by fire. The making of the film itself is a journey that requires Mohamed to search among images of unprocessed pain. He forces himself to work with these images, to enter these moments, and to express his emotions because he ultimately has hope that a human connection can be made with viewers. The film will be a personal story, as seen through my eyes and the people with whom I’m worked during the war. The film is about human connections and does not seek to campaign for any political party or policy, nor to assign blame. This is not because I don’t see the urgency of the political debate or the importance of accountability, but because I am a storyteller who believes that personal stories can open the way, show us what we have in common- human decency and human dignity. My war experience was very hard, and I am still trying to work out my deeper feelings. The filmmaking process forces me to do this, and this is a good thing. I came to Norway in October 2014 to participate in a conference and screen some of my short films. Actually I should have been in Norway in earlier but the war prevented me from going. I was supposed to stay only one month, but after only one week Egypt closed the border with Gaza. I went from becoming stuck inside Gaza to being stuck outside Gaza. My Norwegian hosts and friends were very generous and understanding. They also helped me to come out of myself and urged me to make this film. I was thinking of home all the time. I was walking around with the war inside of me. While I was filming the ambulance team, I knew I had to make a film about these days, everybody know that, but I didn’t know when or how I could do this. The ambulance crew asked me again and again, “When will you finish this film? We need to see ourselves, see how we are working during the war”. It’s a heavy responsibility. It also gives me a feeling of pride, that I might also contribute something. The people of Gaza know how hard is is to live a life under constant attack, but not all of the people see the details up close. Few people are really on the front line, close to everything. Even though I myself had lived through 2 wars and 2 Intifada before, nothing prepared me for my experience during the last war. Every phone call was bad news. The next call and the next… it got worse and worse. It could be my family, my neighbours. Our ambulance could be hit at any time. It was the first time in my life to be so close for a situation like this. I started to understand that each TV image is just a small part of a big story. 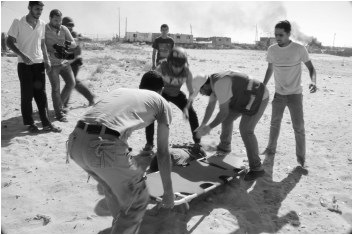 Even though I had lived all my life in Gaza, I was shocked every day, moment to moment. When people in Gaza see this film, I think they too will be shocked. They will be sad, remembering the war and everything they have lost. They will also feel glad that this will be remembered, that no one can say it never happened. No one can erase or deny our pain. The world must remember. Both in Gaza and outside, people will also see how we survive. The film must also remind people we are still alive. We can still smile. We maintain great hope. The best thing about the war was that I gained a new family inside the ambulance crew. I learned what hard work and courage looks like. I felt and received real love.